Changi, as an airport, is sheer delight. It is efficient, vast, devoid of any bustle or stress. I commented to Emily, as we passed through, that “I could live in Changi.” The arrival lounges are serene, the travelators silently whisk hordes of humanity towards their destinations with music, orchids and pumped scent, restrooms are practically sterile as brutally clean. I really feel I could drift around the concourse for an hour or two before being asked to leave by security and pushed into a waiting taxi! 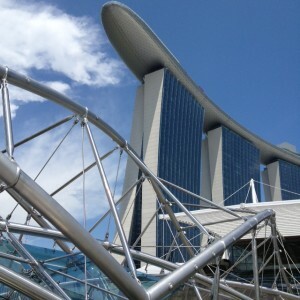 As you arrive into the Marina Bay area the architecture attracts attention; the Marina Bay Sands Hotel (pictured below) with its surf board structure atop its glassy columns, the high-rise offices and residential towers, each visage distinct and edgy. The Fullerton Hotel cements everything in place around the bay, this building was the old post office. It dwarfs the more contemporary Fullerton Bay Hotel. The smaller hotel still packs a punch with its irregular cube design, cool interiors for afternoon tea and inviting roof top cocktail bar with panoramic views. 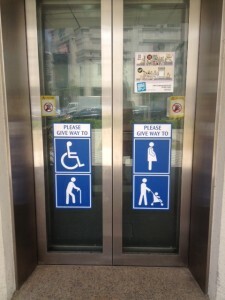 All accessible. A gentle stroll around the Marina reveals a multitude of spectacular engineering feats. My particular favourites are the Helix Bridge (pictured above) replicating a strand of DNA, it compliments the Science Museum (seen below) shaped as an overly large, solid, white lotus flower. Many of the building have slatted or open features that allow another intriguing view through and beyond. I love that attention to detail allowing the pedestrian to see buildings with the unique perspective from the ground up to the sky or through to the water. 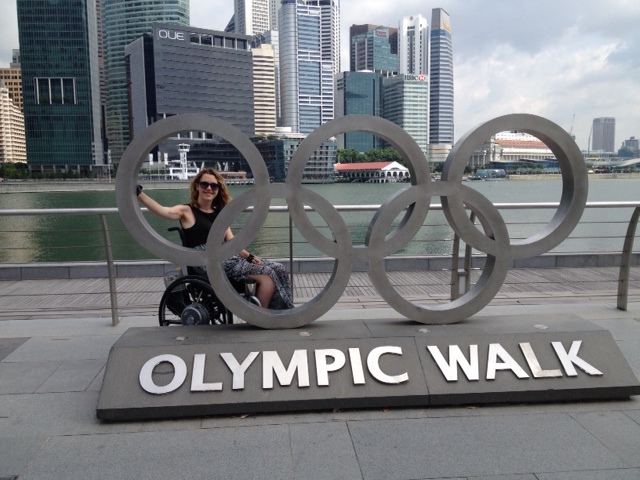 All can be enjoyed from a wheelchair or from a quirky recliner on the Olympic Walk. The MRT is rather like Changi, so enticingly clean, efficient and wheelchair friendly that I wish everywhere could replicate its accessibility. 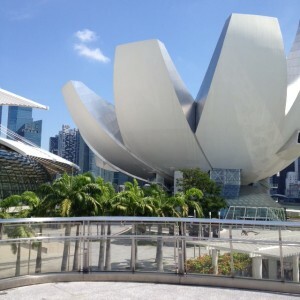 Emily and I choose our destination; Bugis, Botanical Gardens, Bayfront, Raffles, Orchard Road, Chinatown as guaranteed access, the Singapore MRT is a credit to mass transport, it works on every level. Buses are more challenging but as the MRT is so brilliant and easy Emily and I have left the Singapore Bus Service (SBS) to run without us. Modern Singapore is wheel-ie accessible but older buildings and more traditional communities like Little India are Singapore’s Achilles. 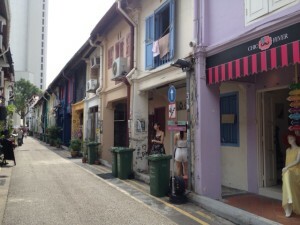 We ventured to Haji Lane (pictured below) near Bugis, all was straight forward if you ignore the annoyingly placed large green bins that block the sidewalk. Emily artfully maneuvered herself past several obstacles and over the curb cuts that can be too acute and racy. We were finally rewarded with this little bijou lane of boutiques, restaurants and cafes. Emily could roll along in the centre of this small pedestrian way but was hindered from entering any shop fronts by a robustly square cement storm step running the entire length of the street. She could only peer into the distant boutique frontages. We had a cup of tea in a quaint cafe, I sat at the table with a cream bottle full of flowers sipping English Breakfast tea while Emily had her beverage parked in the gutter! We had a delightful day of excitement and adventure and we take all the challenges that wheelchair users face as the spice of life. 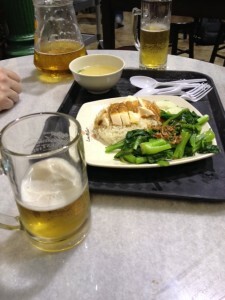 Singaporeans get excited about food, something we share. Restaurants and cafes offer diverse choices, all delicious even if I can’t pronounce anything correctly. The Lau Pa Sat Food Market ( pictured below) temps us with its rustic hexagonal roof and chiming clock tower but it keeps our custom due to the tasty dishes, vast choice and cold beer. 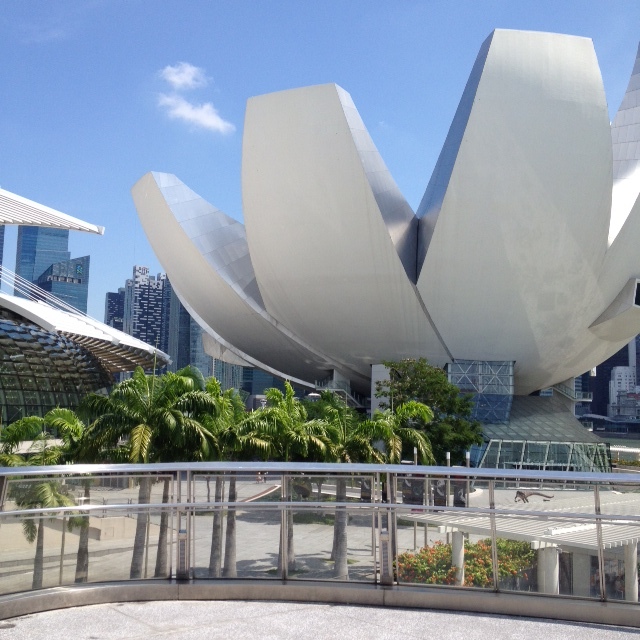 We are spoilt for choice in Singapore; from expensive to economic from street cafes to roof top venues, there is ethnic diversity with traditional cultural favourites which adds up to hard decisions; where to go and what to eat? Orchard Road is a given visit although I lost Emily in the maze of shopping malls so beware as we had a “Where’s Emily” at every turn as she was enticed into another shop-front or boutique! Can you spot her in the photo below? She’s there! 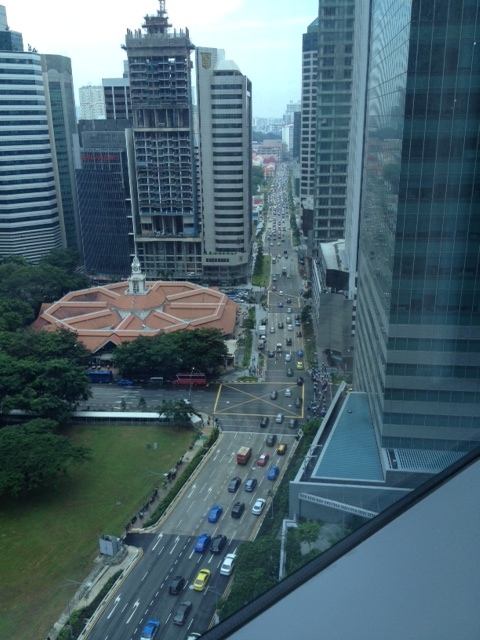 Singapore is a small island with a population of just over 5 million, 2 million foreign-born. It’s a major commercial hub, it hosts a busy port and an enormous financial centre but visitors don’t come for those reasons. 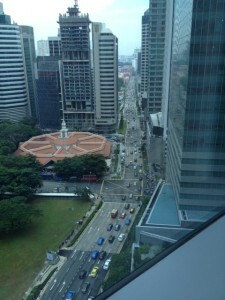 Singapore displays diversity and multiculturalism combined with sophistication and did I mention it’s constantly warm! There is a wealth of events, exhibitions, shows and activities, something for all tastes. Whatever your reason for visiting, Singapore will not disappoint. 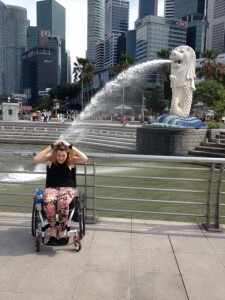 This entry was posted in Travel and tagged Accessibility, Everyday Caring, people with disabilities, Singapore, Singapore MRT, spinal cord injuries, Wheelchair by everydaycarer. Bookmark the permalink. Just adore your yarns, such a wonderful perspective on life as a carer for the beautiful Emily!